So Where Did God’s Freedom Go? Bob and Dr. Flowers develop some of the key principles involved in this centuries-long predestination debate and the two make the case that Calvinists not only deny that men have freedom, but in the same way they also deny that God has freedom. CHAP. V.–MARCION’S CAVILS CONSIDERED. HIS OBJECTION REFUTED, I.E., MAN’S FALL SHOWED FAILURE IN GOD. THE PERFECTION OF MAN’S BEING LAY IN HIS LIBERTY, WHICH GOD PURPOSELY BESTOWED ON HIM. THE FALL IMPUTABLE TO MAN’S OWN CHOICE. Now then, ye dogs, whom the apostle puts outside, and who yelp at the God of truth, let us come to your various questions. These are the bones of contention, which you are perpetually gnawing! If God is good, and prescient of the future, and able to avert evil, why did He permit man, the very image and likeness of Himself, and, by the origin of his soul, His own substance too, to be deceived by the devil, and fall from obedience of the law into death? For if He had been good, and so unwilling that such a catastrophe should happen, and prescient, so as not to be ignorant of what was to come to pass, and powerful enough to hinder its occurrence, that issue would never have come about, which should be impossible under these three conditions of the divine greatness. Since, however, it has occurred, the contrary proposition is most certainly true, that God must be deemed neither good, nor prescient, nor powerful. For as no such issue could have happened had God been such as He is reputed–good, and prescient, and mighty–so has this issue actually happened, because He is not such a God. In reply, we must first vindicate those attributes in the Creator which are called in question–namely, His goodness and foreknowledge, and power. But I shall not linger long over this point for Christ’s own definition comes to our aid at once. From works must proofs be obtained. The Creator’s works testify at once to His goodness, since they are good, as we have shown, and to His power, since they are mighty, and spring indeed out of nothing. And even if they were made out of some (previous) matter, as some will have it, they are even thus out of nothing, because they were not what they are. In short, both they are great because they are good; and God is likewise mighty, because all things are His own, whence He is almighty. But what shall I say of His prescience, which has for its witnesses as many prophets as it inspired? After all, what title to prescience do we look for in the Author of the universe, since it was by this very attribute that He foreknew all things when He appointed them their places, and appointed them their places when He fore knew them? There is sin itself. If He had not foreknown this, He would not have proclaimed a caution against it under the penalty of death. Now if there were in God such attributes as must have rendered it both impossible and improper for any evil to have happened to man, and yet evil did occur, let us consider man’s condition also–whether it were not, in fact, rather the cause why that came to pass which could not have happened through God. I find, then, that man was by God constituted free, master of his own will and power; indicating the presence of God’s image and likeness in him by nothing so well as by this constitution of his nature. For it was not by his face, and by the lineaments of his body, though they were so varied in his human nature, that he expressed his likeness to the form of God; but he showed his stamp in that essence which he derived from God Himself (that is, the spiritual, which answered to the form of God), and in the freedom and power of his will. This his state was confirmed even by the very law which God then imposed upon him. For a law would not be imposed upon one who had it not in his power to render that obedience which is due to law; nor again, would the penalty of death be threatened against sin, if a contempt of the law were impossible to man in the liberty of his will. So in the Creator’s subsequent laws also you will find, when He sets before man good and evil, life and death, that the entire course of discipline is arranged in precepts by God’s calling men from sin, and threatening and exhorting them; and this on no other ground than that man is free, with a will either for obedience or resistance. 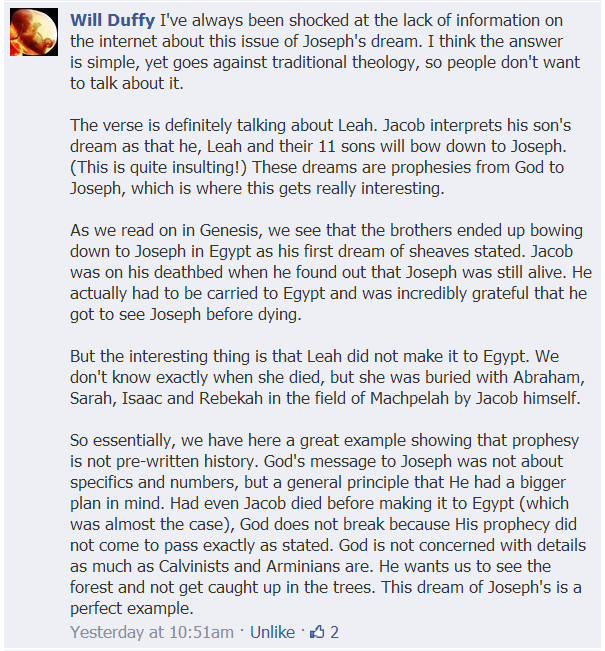 Where is Freewill in the Bible? Gen 50:20 As for you, you meant evil against me, but God meant it for good, to bring it about that many people should be kept alive, as they are today. These passages seem to clearly teach that God orchestrated the sin of Joseph’s brothers in order to bring about a greater good. The plain sense of a passage is not always the correct sense. Consider evangelist Stephen’s explanation in his swan-song sermon in Acts. 9 “The patriarchs, jealous of Joseph, sold him into Egypt; but God was with him, 10 and rescued him from all his afflictions, and enabled him to win favor and to show wisdom when he stood before Pharaoh, king of Egypt, who appointed him ruler over Egypt and over all his household. According to Stephen, God’s action began after the sin of Joseph’s brothers. God worked through various people to bring Joseph into a better situation in which the work of God would be evident. He granted that Joseph would have favor in the eyes of his master Potiphar (Genesis 39:4, which did not work out all that well), his jailer (Genesis 39:21) and Pharaoh (Genesis 41:44, Acts 7:10). Thus, God did indeed mean it for good but only after the fact of the brothers’ sin. God did not need the sin of these brothers to accomplish his plan. God took a negative intention and worked out a positive result. This interpretation was understood by Stephen in Acts. In Isaiah, for example, God complains that He has reared children but they have disobeyed Him. (Isa. 1:2 NRSV; cf. Isa. 30:1, 2, 3, 9, 12, 13) God then reasons with them: “Wash yourselves; make yourselves clean; remove the evil of your doings from before my eyes; cease to do evil, learn to do good; seek justice, rescue the oppressed, defend the orphan, plead for the widow.” (Isa. 1:16, 17) Does God not have a purpose? Yes, God has a purpose, and God has a decree for the ages. But God also declares: “The look on their faces bears witness against them; they proclaim their sin like Sodom, they do not hide it. Woe to them! For they have brought evil on themselves.” (Isa. 3:9 NRSV, emphasis added) God pronounces blessings to the innocent (Isa. 3:10) and justice to the guilty (Isa. 3:11) — “for what their hands have done shall be done to them.” God even grieves over the willing rebelliousness of His people: “What more was there to do for my vineyard that I have not done in it? When I expected it to yield grapes, why did it yield wild grapes?” (Isa. 5:4; cf. Isa. 9:13, 14, 15, 16, 17) Isaiah betrays the Calvinist. In Jeremiah, God is, again, angry with His rebellious people, leading us to ask: If He decreed, rendered certain and necessary, and brought about their rebellion, then why would God be angry? God is not schizophrenic: He does not commit mind-control, bringing about one’s rebellious heart, only to then judge the individual for doing what He decreed for them to do. (Jer. 2:13, 14, 15, 16, 17) We find God Himself admitting that human beings have the ability to reject His authority. The LORD said, “Indeed, long ago you threw off my authority and refused to be subject to me. You said, ‘I will not serve you.’ Instead, you gave yourself to other gods on every high hill and under every green tree.” (Jer. 2:20 NET, emphases added; cf. Jer. 2:29) But how can the Israelites reject God’s sovereign authority? How can they refuse to be subject to Him, since He has strictly foreordained all that comes to pass? God, allegedly, foreordained their rebellion, which they, allegedly, “freely” committed, and then God punished them for it. Jeremiah betrays the Calvinist. In Ezekiel, we note the sovereignty of God, rightly defined, and the free will and responsibility of human beings created in His image (Ezek. 3:6, 7, 18, 19, 20, 21, 27; 5:6, 7, 8, 9; 6:9; 9:9, 10). As a matter of fact, the prophet informs us of God’s relationship to the thoughts of people: “Mortal, prophesy against the prophets of Israel who are prophesying; say to those who prophesy out of their own imagination; ‘Hear the word of the LORD!’ Thus says the Lord GOD, Alas for the senseless prophets who follow their own spirit, and have seen nothing!” (Ezek. 13:2-3, emphases added; cf. Ezek. 13:8, 9, 10, 17; 20:32) God does not wish for their adversity and treachery: “You have discouraged the righteous with your lies, but I didn’t want them to be sad. And you have encouraged the wicked by promising them life, even though they continue in their sins. Because of all this, you will no longer talk of seeing visions that you never saw, nor will you make predictions. For I will rescue my people from your grasp. Then you will know that I am the LORD.” (Ezek. 13:22-23 NLT, emphasis added) Ezekiel betrays the Calvinist. The nations that are saved enter the city, except for those who are unclean. Why are these passages worded as such if there can no longer be sin? Would this suggest that the natural understanding of “no more tears” in the same chapter is due to the wicked not being allowed entrance? 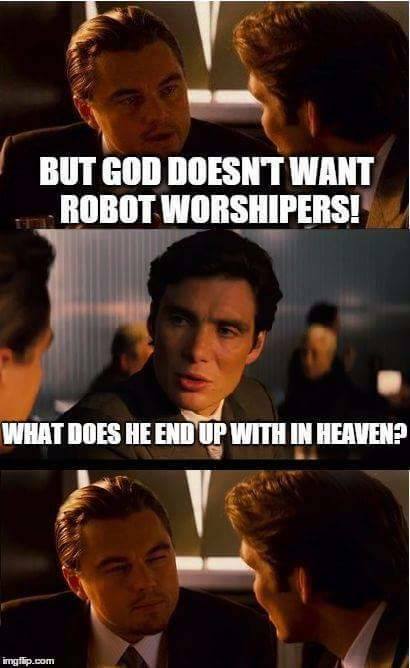 Why does this meme assume there is no free will in heaven? There is ample evidence even within the author of Revelation that mankind will always have free will to reject God. There seems to be no assumption otherwise. Rohan Holt uploaded a file. Michael Saia, the author of “Does God Know The Future?”, has generously agreed to allow me to post a PDF of his book. Please feel free to distribute broadly. The book is still available for purchase, from Amazon & the like, but getting the word out is most important. That God cannot interfere to modify his plans, interfere without the change of a single law of his world, is to me absurd. If we can change, God can change, else is he less free than we–his plans, I say, not principles, not ends: God himself forbid!–change them after divine fashion, above our fashions as the heavens are higher than the earth. So what exactly are Open Theists adding to libertarian free will? Open Theists hold the idea that propositions about future free will acts, in an absolute sense, cannot be true. (I say in an absolute sense, because some Open Theists reinterpret statements about the future in a relative, probabilistic sense, meaning given current factors, Bob will choose chocolate is more likely than not, but not 100% certain). If the statement, “Bob will eat chocolate” is true, then Bob is not free with respect to eating chocolate. Propositions about events become true the moment the events happen and not before. Bob himself has the power to change the proposition “Bob chose chocolate” from possibly true to actually true. This is how Open Theists cash out the idea of Bob making statements true and this is the power that Open Theists add to definition of libertarian free will. In an attempt to preserve the notion of God’s power as total control, some advocate what they call biblical compatibilism, the idea that one can uphold genuine freedom and divine determinism at the same time. This is sleight of hand and does not work. Just the fact of our rebellion as sinners against God’s will testifies it is not so. The fall into sin was against the will of God and proves by itself that God does not exercise total control over all events in this world. Evils happen that are not supposed to happen, that grieve and anger God. It is remarkable how constantly it is implied, or assumed, in the Scriptures, that God does not foreknow the choices of free beings while acting under the law of liberty. As for example, the words of Jehovah to Moses, “I am sure the King of Egypt will not let you go.” The angel of the Lord called to Abraham out of the heavens, and said, “Lay not thou a hand on the lad, neither do thou any thing to him; for now I know that thou fearest God seeing thou hast not withheld thy son, thine only son, from me.” These words imply that up to that point God did not absolutely know what the final decision of Abraham would be. If he did foreknow it, a seeming falsity, or pretense, is assumed, and a deception practiced upon the reader. “Now I know that thou fearest God.” Of Solomon God promised, saying, “I will be his father, and he shall be my son. But if he commit, iniquity, I will chasten him with the rod of iron.” “He led thee these forty years in the wilderness, to humble thee, to prove thee, to know what was in thine heart whether thou wouldst keep his commandments or no.” And the Lord said, “It repenteth me that I have made man.” Moses said, “It repented the Lord that he had made man, and it grieved him at his heart.” These words seem to imply a heart-felt regret on the part of God, and that he had not foreknown with certainty the fall of man. For, if he had foreknown the wickedness of man, why did he grieve after its occurrence more, than before? And if he grieved equally before he made Adam, at the sight of his future sinfulness, why did he not decline his creation? If he foreknew the fall, not merely as a contingent possibility, but as an inevitable fact, then this mournful declaration makes him appear inconsistent. And then who can sympathize with him in his grief for having created man? Evidently, in this passage, God implicitly, but clearly, assumes his non-foreknowledge of the certain future wickedness of man. And that assumption is necessary to give consistency to the divine conduct and statements, and to establish any claim on, the sympathy of an intelligent universe in his great disappointment. But when the whole transaction is considered in view of that assumption a light, luminous with the most interesting suggestions, emanates from this troublesome text. Luke 7.30: But the Pharisees and the lawyers rejected for themselves the counsel (boule) of God, being not baptised of him. Mere human beings, of course, could not thwart God’s ultimate plan for the world, but they both can and do thwart His plan that they, as individuals, should have a part in it. The Pharisees could not prevent God’s ultimate plan achieving its end. The New Heaven and New Earth will come, whether they want it or not. In this sense we may well cry ‘Hallelujah, the Lord our God, the Almighty, reigneth.’3 But what they can do is to personally opt out of the new creation to come. God ordains that the new heaven and earth will come, He does not ordain which particular individuals will accept His plan for them to have a part in it. Oh wow! God has determined that we should seek him. I recommend reading the whole of Pauls sermon on Mars Hill as it destroys Calvinism. Those who don’t want to be with God are never going to be forced to be with Him. Forced love is not love; it’s something else. You see, if God forced put everybody who didn’t want to be with Him in Heaven, Heaven would then be like a prison with people hating where they were. Consider the downside to free-will (I suggest there is no downside but stay with me here): If, in the 6,000 years of human history, if man’s free-will resulted in only one person choosing to love God and only that one person ended up in Heaven, the perfection of love freely given would be no less than if the majority chose to be with Him. Love freely given is love. If a man forces his love onto a woman, we’d consider him sick. God isn’t sick. Matt- I think Open Theists should say that the free decision of any individual is incalculable, inscrutable, and cannot be known in advance with absolute certainty. But I do think the One who knows all previous moments and decisions can predict with uncanny accuracy, at least sometimes, what a person will freely choose. But predict is different than foreknow with certainty. The nature of the debate between compatablism and incompatablism centers around the fact that (1) determinism and human freedom seem to contradict each other (2) some sort of human freedom seems necessary for moral responsibility, and (3) most everybody, including most determinists, want to retain their belief in moral responsibility. Such determinists have therefore advocated for a modified kind of freedom which they see as compatible with determinism, in an attempt to save their belief in morality. This special kind of freedom is often called “compatablistic freedom” or “soft determinism.” The idea here is that someone is free if and when they can act as they desire, rather than against their will. Now, clearly this concept of freedom is compatible with determinism, for external causes (i.e. God, ones’s neurons, one’s environment, etc.) could easily determine somebody to desire something and achieve the goal of that desire. Nobody really disputes that. But the compatablist wants something more than just any kind of freedom: she wants a freedom that allows for moral responsibility. And lots of people think you can’t get moral responsibility unless determinism is false. I am one of those people. Open Theism’s defining claim: divine epistemic openness regarding future contingents. The defining claim of open theism is pretty simple: divine epistemic openness regarding future contingents. Now, that’s a mouthful, so let us break it down. Some aspects of the future are presently ‘settled’; that is, given everything at present which has anything to do with influencing or bringing about the future, some things about the future are determined to be. The causes and influences (divine and created) that presently exist limit the future to a single possibility with respect to some particular event or state of affairs. Openness is based on God as the Living God. The five most fundamental attributes of God are that He is Living, Personal, Relational, Good, and Loving. These faithfully represent God the way that Scripture presents Him, and starkly contrast with the Greek and Roman philosophical construction of God. The Openness attributes are heavy on scriptural influence, and light on man’s philosophy. Children can understand the most important aspects of God. For “out of the mouth of babes… You have perfected praise” (Mat. 21:16) for “of such is the kingdom of heaven” (Mat. 19:14). Whereas adults wrestling with the metaphysical conjectures of intellectuals must first learn even how to pronounce omniscience, omnipresence, omnipotence, immutability, and impassibility. Thus Scripture warns us against human philosophy over substance (Col. 2:8), and who can deny the Calvinist emphasis on the writings and traditions of men. For full post, click here. Also see: Enyart on God being Open.